At 1120 on March 21, 1945, Flight Leading Seaman Tamotsu Matsubara took off from Kanoya Air Base as a crewman in a Navy Type 1 Attack Bomber (Allied code name of Betty) carrying an ōka rocket-powered glider bomb. 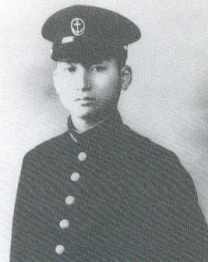 Matsubara was a member in the Jinrai Butai (Thunder Gods Corps) 1st Ōka Squadron. He died in a special (suicide) attack southeast of Kyūshū at the age of 19. From 1420 to 1445, a group of about 50 American Grumman fighters intercepted the 18 Betty bombers that had taken off from Kanoya and shot all of them down before any ōka glider bomb could be released. He was from Ehime Prefecture and was a member of the 3rd Toku Otsu Class of the Navy's Yokaren (Preparatory Flight Training Program). Plum blossoms fall. Then in the faint sunshine of spring, glorious cherry blossoms begin to open all over. With gusts of spring wind, cherry blossoms on many branches are split to pieces and adorn the ground like cotton. Ah, it is a good time to fall as a young man of Japan who lives for an eternal cause. I will go and fall with the cherry blossoms. There are many memories from the old days when I was young, but now I will forget as a dream. Dark clouds in the Pacific Ocean truly are rising, and the mainland is being attacked in this time of crisis for the Empire. I as a humble servant will do a part of insignificant loyalty. The letter on this page comes from Kanoya Kōkū Kichi Shiryōkan Renraku Kyōgikai (2003, 31). The biographical information in the first paragraph comes Bungei Shunjū (2005, 568-9) and Kanoya Kōkū Kichi Shiryōkan Renraku Kyōgikai (2003, 31). Bungei Shunjū, ed. 2005. Ningen bakudan to yobarete: Shōgen - ōka tokkō (They were called human bombs: Testimony - ōka special attacks). Tōkyō: Bungei Shunjū.